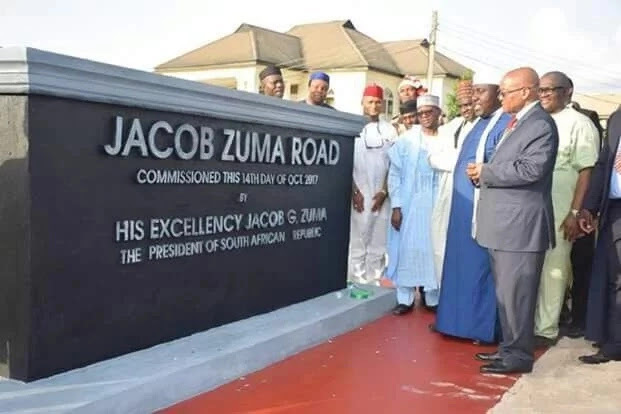 The Imo State Governor, Rochas Okorocha has said he erected a huge statue in honour of South African president, Jacob Zuma, to attract investment to Imo state. The governor said Zuma’s visit to Imo state was to sign a memorandum of understanding between Jacob Zuma education foundation and Rochas foundation college of Africa. The PDP for the 12 years they held sway never attracted any meaningful visitor to the State except PDP NEC members who were coming to loot the State." The government said Rochas owes no apology for erecting the statue, adding that if erecting statues will develop imo state then the government will have no option than to erect as many of such structures as possible. "And in case these “Galatians” do not know, if all we need to do to attract good things or investments to Imo is erecting statues, then, we have no option than to erect as many of such structures as possible. We owe no one apology. Rochas made a promise to open the doors of Imo to the rest of the world, for good and he is doing that and we cannot be deterred by these enemies of our people," the government said.